STR swimmer clinics utilize the most current technology (stroke analysis with Aquanex+Video), feature extensive feedback, and provide individualized technique instruction. Classroom instruction that features a biomechanical model of optimal technique (MONA). Specific cues about the orientation of body parts standardize communication with the swimmers and expedite learning. The swimmers learn how to focus on exactly what to see and feel (using visual and kinesthetic cues) to control their movements and make them as effective as the model. In-pool instruction, where swimmers perform numerous repetitions focused on the cues from the classroom sessions (“cue-focused” practice). Each swim is preceded by instructional reminders and followed by individual feedback about compliance with the cues. These sessions also utilize other learning acceleration methods like “skill-isolation” drills, exaggeration strategies, and speed progressions. Aquanex synchronizes video and force data to capture complete information about technique. Information on all four strokes can be captured on a swimmer in less than 10 minutes. Testing only requires one end lane of the pool and does not interfere with swimmers in the other lanes. Classroom feedback allows swimmers to see exactly how much force they are generating throughout the entire stroke cycle. The playback of the video and force data shows the relationship of arm positions with fluctuations in force. Wasted motion and force losses are pinpointed. The data makes it very clear how the swimmers need to make changes to swim more like the biomechanical model. The data also reinforces the positive elements of their technique. Our comprehensive services incorporate advanced technology to enhance and support the continued development of each swimmer. 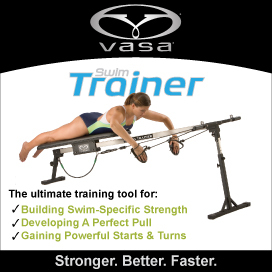 Each of the following options are part of a comprehensive approach focused on faster swimming. Instructional clinics begin with a classroom presentation of a biomechanical model for optimal performance (see MONA example below). MONA was developed from the principles of physics as well as the information derived from thousands of Aquanex trials. The model is used to reinforce positive technique elements and demonstrate elements that the swimmers have not yet mastered. The session includes a presentation of the phases of the stroke cycle and specific information about orientation of the body segments, along with visual and kinesthetic cues to help the swimmers better understand how to position their bodies, control their movements, and monitor their own technique. A pool session immediately follows the classroom session. Swimmers perform numerous repetitions focused on the cues from the classroom sessions (“cue-focused” practice). Each swim is preceded by instructional reminders and followed by individual feedback about compliance with the cues. These sessions also utilize other learning acceleration methods like “skill-isolation” drills, exaggeration strategies, and speed progressions. The mental involvement is stressed so that the participants understand how to continue to focus on technique when they resume their normal training routine. The Aquanex+Video Analysis System consists of an underwater video camera, sensors worn on the hands to measure force, and an interface to input the force and video signals into a laptop computer. The video and force data is saved in files on the computer and can be replayed with the Aquanex software. The analysis clinic includes classroom and pool sessions. The swimmers are first tested with Aquanex+Video (to collect synchronized underwater video and hand force data) in a pool session. The testing session is immediately followed by a feedback session in the classroom. Each swimmer will have the positive elements of his/her technique reinforced, as well as receive feedback about the limiting factors. An example of an Aquanex image is shown below. We conduct clinics for teams, organizations and groups all over the world. Contact us today to ask questions or plan your clinic and reserve dates!